Scent Description: Put simply, this is a leaves dupe. Hint of cinnamon and an all around Fall scent. Melting Power: 2/5 Unfortunately all I got was about 5 hours from this entire tart before the scent died off. Does anybody happen to know what happened to Crabby/Dutch Candle Co.? I have so many of their tarts but when looking for their website for this post I couldn't find anything recent. It's like they just stopped one day and never looked back. Welcome to my Science Room! I figured I would give a little tour of what Michael and I lovingly call the science room! By tour I mean you get to see the one table all the magic happens at/on. 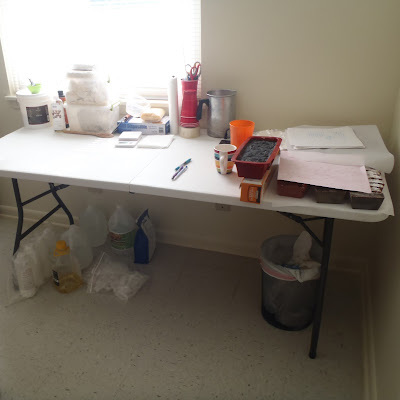 Above you can see the general look of the table, minus the containers I use while actively making soap. Usually the table is a lot more cluttered. 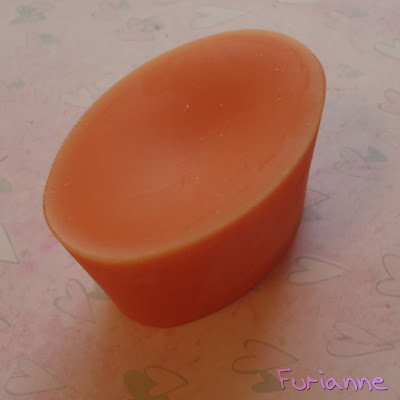 I recently moved our stereo system to right under the table so I can jam out to some music while making my soap. On the left are my oils and butters. This picture is a bit old and I've added some stuff, but you get the idea. I have palm oil, hemp seed oil, almond oil, castor oil, coconut oil, shea butter, cocoa butter, and olive oil (which is usually stored under the table). I also keep a bag of beeswax pellets in this area, but I don't typically use it for soap. Under the table I have my lye, distilled water, vinegar (to neutralize any lye spills), epsom salts, and empty chapstick containers. I make all of the chapstick for myself and my immediate family, so we tend to go through a lot. The chapstick is what I use my beeswax for. In the middle of the table I have a hodgepodge of items. Gloves, solo cups (useful for small pour-offs or just to hold a dirty stick blender in), my loaf cutter, safety goggles/mask (not pictured)... I dunno, you can see all of it, can't you? The metal tin has some wax tart making supplies for the days where I feel like pouring some wax. On the very right is where I put my soaps that have been cut and need to cure. I should have put some of my more recent soaps here that don't look icky :). The soaps you can see right now are my first several batches I'd made after my year long hiatus from soapmaking, so you can sorta tell I was just getting back into the hang of things. At this point there are 3 layers of soap layered with some parchment paper on this end of the table. Hey, I said that this table is usually cluttered! Along another wall of the room, by my nail art supplies and wax storage are my fragrance/essential oils. I used to have a lot more, but I've been actively trying to use up what I do have so there's less stuff to throw out/leave behind when we move. Silly restrictions on what can and cannot be packed and shipped... *grumble* As is I have no idea how we're going to handle my nail polish. And yes, I'm still here! We're getting ready for our (eventual) move, and I find my free time all eaten up by appointments left and right. Passports, immunizations, general health/check ups to make sure that I'm able to travel to the country Michael has projections for... it's all sorts of fun, outside of me cleaning up/tossing/using up items that I know we won't be able to bring with us. That, and the lovely dramallama decided to rear her head while I tried to participate in groups set up for spouses to help each other out with the moving process. I got to the point where I'd even typed out a very long winded complaint post about it. Ultimately I decided not to post it. Long story short: don't participate in 'support/help' groups set up for military spouses. Don't ask any more of me unless you want a long winded post LOL!